I can’t believe Easter is less than two weeks away! 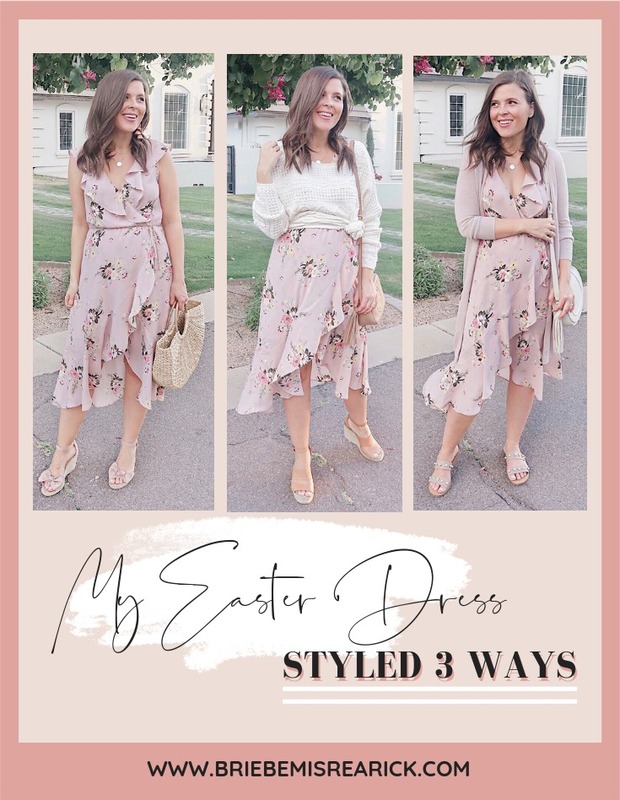 I found the perfect Easter dress this past weekend and couldn’t wait to style it and share it with you! It’s under $35 and comes in 9 pretty floral prints that are perfect for the holiday or any upcoming spring/summer festivities. It’s non-maternity but also works great for expecting mamas thanks to the high waist line. I’m 24.5 weeks pregnant in the photos below to give you an idea of how it will look. The dress is super versatile so I actually styled it three different ways to give you some inspiration. I hope you love it as much as I do! At the bottom of the post, I created a collage with all 9 different prints. You can just click on the collage and it will take you directly to the dresses! It’s no secret that I love the color pink, so for the first look I decided to accessorize with blush pink wedges and pink earrings. I paired the Easter dress with my go-to spring/summer straw tote. I’ll likely be wearing this exact look or something super similar on Easter because it’s usually pretty warm here so no sweaters for me! I think this might be my favorite of the three looks! I love how the dress transforms into a skirt by simply throwing a sweater over it. I’ve really been trying to be conscious of buying clothes that I can re-wear regularly without getting sick of which is why I typically shy away from too many prints and stick to basics. I love that this dress is so versatile so I can add a pretty print to my closet that I’ll actually wear again and again. It’s going to cool down here this weekend, so I’m hoping I can wear this exact outfit out for a date night! If heels aren’t your style, this dress also looks great paired with flat sandals. 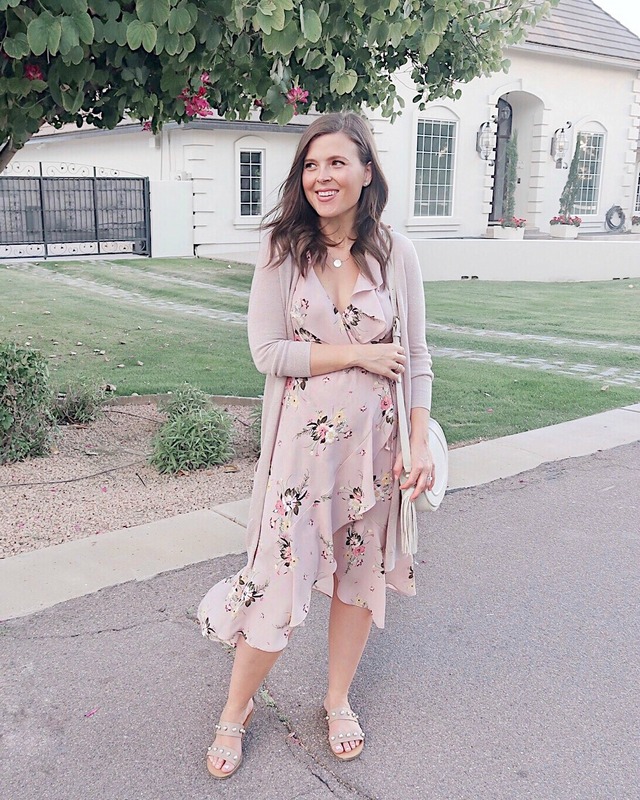 I love the way mauve and taupe look together, so I wore the dress with my favorite cardigan ever which also happens to be my most worn piece of clothing. It’s seriously the best! I accessorized with an ivory bag to break up all of the similar colors in the rest of the outfit. Click on any of the dresses above to shop them! Did you size up because of the pump? I’m 23.5 weeks myself. I didn’t size up and found there was plenty of room! Congrats to you!